You’re stuck with a small bathroom. Well, that doesn’t necessarily mean you can't fit in everything you need. Where square footage falls short, creative bathroom storage solutions go the extra distance. In a small bathroom, furniture elements like vanities often eat up what little available floor space there is, and they provide too little usable storage in return. Look instead to the walls and other underused surfaces. Put up shelves or mount hooks or rails. Make use of behind-the-door storage, over-the-toilet units, and corner towers. Judiciously placed baskets and other attractive containers for toiletries and towels are also smart amenities for small bathrooms. The good news: Many of these small bathroom storage solutions are budget- and DIY-friendly projects. Traditionally, bathroom cabinetry was limited to small medicine cabinets above the sink and sink vanities with limited storage space. That’s changing. In small bathrooms today, homeowners are putting in space-saving plumbing arrangements in order to use every cubic foot of their vanities. It takes some ingenuity, but if you can install the drain, trap, and supply lines and valves close to the wall, then you can buy a vanity with several deep drawers that slide under the sink. Drawers allow better organization of miscellaneous bathroom items—hair dryers and tissue boxes, etc. Drawers also make it easier to see and reach stored items. Replacing a small medicine cabinet with a larger one adds a surprising amount of shelf space. In the past, medicine cabinets were installed in the void between studs in the wall behind the sink, severely crimping their storage capacity. Newer models hang on the wall and tend to be much bigger. A cabinet that’s three feet tall is not uncommon. Be forewarned that such units are heavy, especially those with mirrored doors are mirrors. 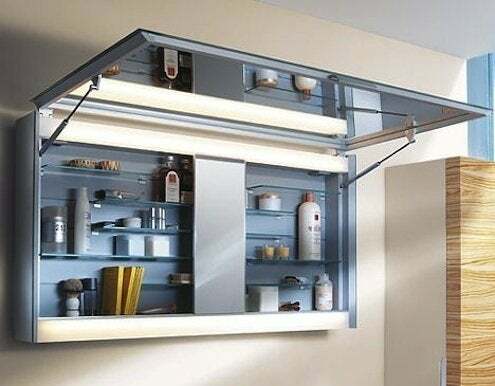 Hanging one may require the installation of blocking between studs inside the wall (which in turn usually requires the removal of some wallboard); the cabinet can then be screwed securely to the blocking. Another strategy for small bathrooms is to install an over-the-toilet cabinet, making use of space normally wasted. These cabinets are typically shallow (only 8- or 9-in. deep) to allow adequate head room, but they’re ideal for storing small items. Some incorporate a towel bar for hanging hand towels. In large bathrooms, double-width vanities with two sinks are popular. In really large bathrooms, there may be room for base cabinets that flank the vanity and have wall cabinets above. In such cases, the old medicine cabinet is eliminated and replaced with a lockable drawer. Large bathrooms often incorporate tall cabinets or corner cabinets, and just as as often these serve as linen closets. Before storing linens in a bathroom, however, make sure you have a vent fan (a properly functioning one). The vent fan should run for 5 or 10 minutes after showers and baths to keep humidity low (installing a timer switch is a good idea). Linen cabinets include various combinations of shelves, drawers, and hampers.